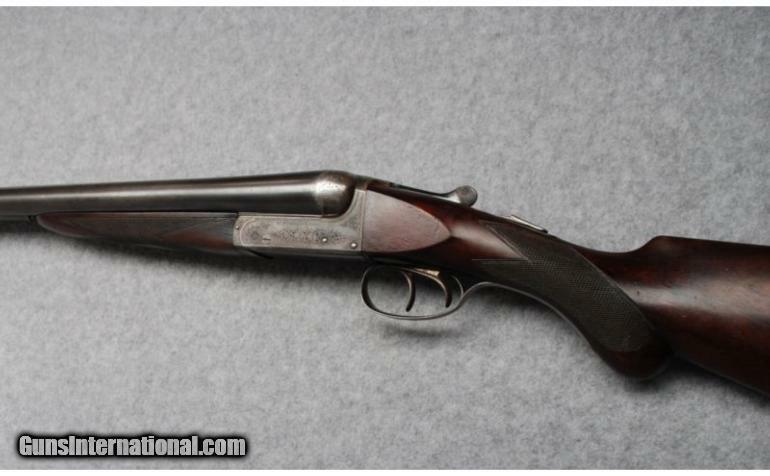 The British are famous for their game guns: 12 gauge side-by-sides with 28″ or 30″ barrels, 2 1/2″ chambers, a straight stock, and doubles triggers. Most of these doubles weigh in at around 6 3/4lbs, and they’re ideal for taking everything up to pheasants out to about 40 yards. Of course, the Brits also made heavy twelves for waterfowling and pigeon shooting. The William Powell double you see here is one of them, and from what I can see, it looks like it’s a good deal. With original 2 3/4″ chambers, it should be proofed for 1 1/4 oz. loads – more than enough lead for clays shooting – and with it’s high stock and should fit most shooters pretty well. This fine Birmingham double found its way to America by a rather circuitous route through Melbourne, Victoria, Australia. The left barrel is marked with the maker’s name and Carr’s Lane, Birmingham address and the right is marked, “Made for Donald Mackintosh, Melbourne”. Research indicates that Donald Mackintosh, Pty. Ltd. was a gunsmith and sporting goods store located on Latrobe Street in Melbourne and engaged in the importation of fine firearms from all over the world. An ad from the 1950’s announced the recent arrival of W. Powell and G. & S. Holloway hammerless SxS guns made to Mackintosh’s specifications. 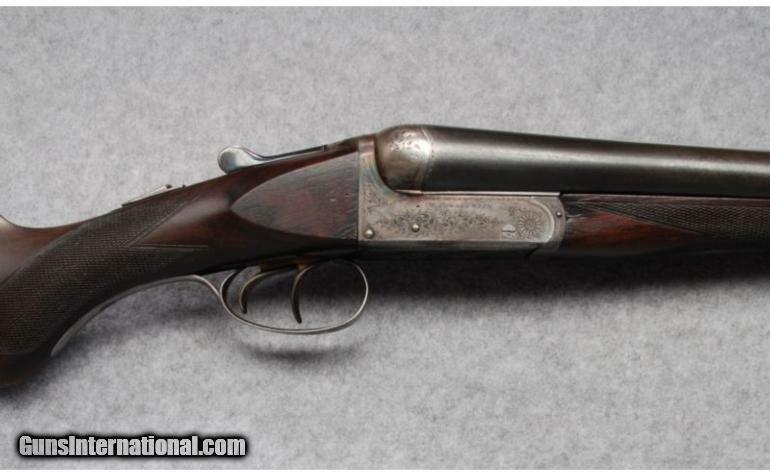 This would explain the pistol grip stock found on this shotgun as opposed to the classic English straight stock more frequently encountered on guns of this type. In any event, it is an excellent example of one of Birminham’s finer gunmakers with handsome engraving and barrels that ring clear and true. The lockup is as tight as the day it left England. Metal Condition: Engraved, case-colored receiver retains approximately 60% of original coloring with some vibrant areas remaining. Barrel bluing is approximately 85 – 90% with some freckling and patina. Wood Condition: Stock and forend are structurally sound, but carry the bumps and impression marks typically found on a field gun.